Pepper spray is a non-lethal self-defense product which can be used not only to ward off human attackers, but also as protection against viscous dogs if you are jogging or even bears and other wild animals when you go camping. Most pepper spray products sold to the public range between 2%-10% pepper spray concentration. However, the percentage of concentration is only one factor to be considered when selecting an effective pepper spray defense weapon. The key ingredient in all pepper sprays is Oleoresin Capsicum (‘OC’ for short). This is just a really fancy horticultural term for pepper juice. The ‘OC’ in pepper sprays can range from the relatively mild jalapeno to the extremely hot habanero. This is where the Scoville Heat Units (‘SHU’) for a pepper spray come into play. A pepper spray device may have a low percentage of concentrated OC but that doesn’t mean it is not effective. It may be extremely powerful because of the particular pepper ingredient (OC) used. The Scoville Heat Units measurement scale ranges from 0 for a bell pepper, all the way up to 2.2 million for a Carolina Reaper (the hottest pepper on the planet). Obviously, pepper sprays don’t use either end of this scale. Most pepper spray products on the market today fall within the range that is extremely effective and yet non-lethal. · The first, and most obvious, thing to do is to have your pepper spray quickly available to reach in an emergency situation. Seconds can become a life/death situation if you are confronted with an attacker. Do not keep your pepper spray in your glove box. Keep it on your body at all times, whether that be a keychain pepper spray, lipstick pepper spray in your purse or a mace pepper gun in a holster. All of these items are available at: Defense Divas Self Defense Products for Women. · Yell ‘FIRE!’ (not HELP or STOP!) at your attacker. This serves several purposes. It will confuse your attacker because he is expecting to you yell for help or to yell at him to stop. He is definitely not expecting to hear that there is a fire. This will buy you valuable seconds to get your pepper spray into your hands and positioned for self-defense. It will also alert people in the area that there is something wrong in the immediate area that they should be concerned about and dial 911. (Sadly, statistics say that most people will not get involved if they hear someone yell for help, but they will get involved and call 911 if they believe a fire is flaming in the area.) This simple action allows you to spray your attacker when he is off guard. · Maintain your concentration of pepper spray on the attacker’s head, keep the actual stream steady. 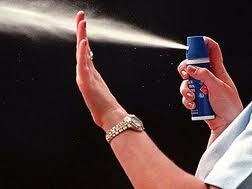 · Spray your attacker with a second burst, if needed, and then move away. Exiting to a safe space is the goal! · Remember, pepper spray doesn’t work instaneously. It requires a few seconds to permeate the membranes. But your attacker will go down and be in excruciating pain while you have given yourself an escape route from the situation. · To find out what pepper spray does to your attacker, read on! First and foremost, pepper spray will drop your attacker! It is designed to be a non-lethal self defense product. It will allow you to escape a potentially deadly situation. You attacker will experience immediate inflammation. The throat will restrict and the temporary paralysis of the larynx will close up, restricting air flow enough to debilitate your attacker and allow you to escape. Extreme coughing and gasping for breath and nausea. Your attacker’s respiratory functions will return to normal within 20-60 minutes. And….it it’s a ‘bee sting’ all over someone’s face, it will attract attention and alert the police and public for weeks to come if your attacker happens to escape getting caught at the site of the attack. Pepper spray products have a secondary effect on muscle coordination. Your attacker may stumble(not be able to run away) and experience extreme disorientation by the effects that it has on the attackers soft membranes (eyes, nose, lungs and throat). They are designed to debilitate an attacker’s immediate senses first. Often times, reports are that after the initial “blast” from a pepper spray and debilitating effects, the attacker still feels the effects that rake over his body for along time. Remember, with a non-lethal self defense product, your first choice is escape. The evidence of the attack will be on the assailant’s body.